Microsoft's E3 keynote speech was heavy on the Kinect announcements with new games, new apps and new features to enhance the revolutionary motion control experience. 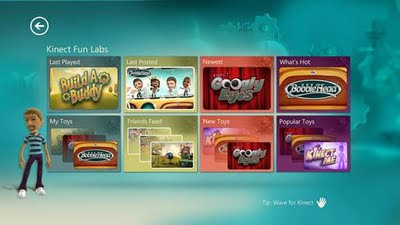 Among the Kinect announcements was news that a brand new hub on the Xbox 360 dashboard, called Kinect Fun Labs, was downloadable through Xbox Live starting today. The new area (seen above) showcases numerous new apps that utilize the Kinect sensor and are available for download. These apps (called Gadgets) enable players to perform actions such as scanning their body to create realistic avatars or funny-looking boobleheads. Kinect Me -- scans your body and clothes and creates an Xbox Avatar in your image. Bobble Head -- scans your face and body to create a replica bobblehead figure that you can manipulate with waves of your hand. Microsoft says Kinect Fun Labs will be updated regularly and has already promised more experiences will begin arriving in July, including Avatar Kinect (wait, isn't this already out?) and Kinect Sparkler (a Gadget that lets players draw on pictures with sparklers). It appears Microsoft will be hosting "elections" to determine the next Kinect Fun Labs Gadgets to produce, as on the official website an election, which ends July 6th, is already underway. Gadgets that can be voted upon include Virtual Conductor, Keyboard Anywhere, Kinect Body Art, Hand Puppets, Digitial Pin Art, and Music Visualizer. Released in late 2010, Kinect for Xbox 360 has been recognized by Guinness World Records as the fastest selling consumer electronics device ever, having sold 8 million units in its first 60 days on sale. That's faster than Nintendo's Wii, Sony's PlayStation Move, and even more than Apple's iPad and iPhone. Microsoft also announced a slew of games that will be releasing soon that will feature Kinect compatibility. These games range from Forza 4, which uses the Kinect sensor to track player's head movements, to Dance Central 2 (now featuring two player simultaneous battles), Fable: The Journey which lets players cast magic with hand movements, Kinect Star Wars for those who have always wanted to mimic dueling with a lightsaber, and Kinect Disneyland Adventures which puts the entire Disneyland experience on a disc. There were even some nice surprises such as Minecraft coming this winter to Xbox 360 with full Kinect compatibility, and a new cinematic action game called Ryse in development by Crytek (the studio behind Crysis 2). In addition to Kinect Fun Labs and games, Microsoft is also expanding Kinect's capabilities by introducing voice search with Bing on Xbox 360. Using voice commands, users can search Netflix, Hulu Plus and ESPN, as well as the Xbox LIVE Marketplace to find the entertainment they are looking for. Furthermore, the company has also stated that users will soon be able to control YouTube videos by using their voice alone.